Plans are currently being modeled by the UAE to build a mountain and seed clouds above it in order to tackle an acute water shortage. This isn’t necessarily geoengineering (extreme weather modification maybe), but the thinking behind it mirrors the wrong approach being taken to tackling climate change, laid out since the Paris Agreement was signed. In the same why that drastically reducing greenhouse gas emissions now is much more certain to be an effective solution to the problem of climate change than future geoengineering, or relying on unproven negative emissions technologies to balance carbon budgets in the second half of the century, surely massive water conservation efforts are much more likely to be successful in tackling a water shortage than trying to engineer geography to make it rain more? The article below is a good summary of the arguments against the UAE’s new mountain. It sounds like the plot of a summer blockbuster, but the United Arab Emirates is apparently quite serious about building a mountain to increase rainfall in the region. Would it work? Probably. But instead of launching an infrastructure project where a very rich country attempts to dig its way out of a drought, the UAE needs to get serious about conserving its water. The science behind a rain-making mountain is not that outlandish. Moist air arriving on ocean breezes would be trapped by the human-sculpted landform, forcing it up into the atmosphere where it would cool, condense into clouds, and eventually—hopefully!—fall as rain. This is the phenomenon known as a rain shadow, where one side of a mountainous area sees more precipitation (and the other side sees less). Right now, a team of atmospheric scientists are determining the feasibility of such an undertaking. The University Corporation for Atmospheric Research (UCAR) and National Center for Atmospheric Research (NCAR)—both legit organizations—are advising on the project, which is in the “detailed modeling” phase. Of course, that means the team could decide that it’s still not a great idea. And let’s hope they do. The average UAE resident uses an estimated 550 litres of water daily compared to the international average of 170 to 300 litres a day, according to the Federal Water and Electricity Authority. 550 liters is about 145 gallons per person per day, an amount that is astronomically high. In California, where Governor Jerry Brown issued strict conservation measures in 2015, nearly every district was able to cut its water to far below that number. After one year, the entire state was using 23.9 percent less water than the year before. 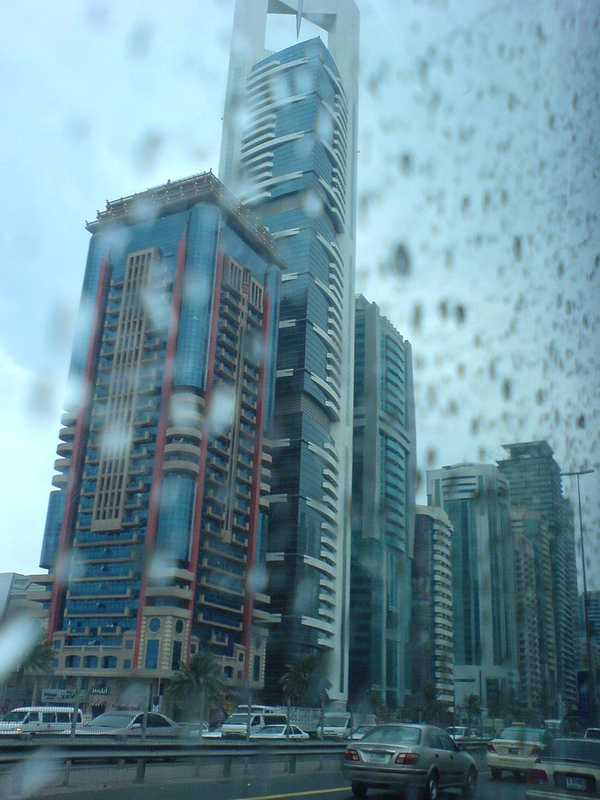 The UAE isn’t known for scrimping on ostentatious infrastructure. It’s got the tallest building in the world (for now) and a harbor filled with artificial islands in the shape of a palm tree. But it’s got a penchant for introducing flashy, financially questionable solutions for civic problems—remember the jet-pack firefighters enlisted to put out its burning skyscrapers? Building a mountain to solve a drought doesn’t make a lot of sense, but it does fit the UAE’s brand. I’m sure it will make a great tourist attraction when it’s not cranking out torrential rainfall (which, to be honest, will be most of the time). But that’s the most messed up thing about this. Mountain-erecting—like its little brother, cloud-seeding—is not only an expensive temporary fix for a bigger problem, it’s also not a sure thing. When the situation gets worse, what happens then? Build another mountain? There’s really only one get-wet-quick scheme that’s proven to work. Stop using so much goddamn water.